This is a great time to be a freelance writer. According to the U.S. Bureau of Labor Statistics, there’s been a 300% demand increase for writers in the last 10 years. Lately, more Millennials are pursuing freelance careers as it’s becoming more of a necessity than a choice. With the 2008 financial crises resulting in more than 2.6 million job losses, it is no wonder that people are breaking into freelancing, particularly freelance writing, to pay the bills. What’s happening now, though, are that tons of freelance writing businesses have sprung up online and are everywhere in social media. If you’re new to freelance writing, you probably feel it’s impossible to get your “voice” heard amongst other writers. Just type into Google, freelance writer for hire, and you’ll see popular writers, like FrelancerFAQs’ contributer Alicia Rades, on the first page. Granted, being ranked on the first page of Google has a lot more to do with SEO strategies than it does with being successful. But, no matter what you type, freelance writer (location), freelance writer hire me, or freelance writer services, you’ll soon realize potential clients are inundated with writer after writer to choose from. Indeed, how can you – a brand spanking new freelance writer– set yourself apart from countless other freelance writers and have a fighting chance landing clients? Having a personal brand not only helps you promote yourself as a writer for hire, but it has the added benefit of making yourself memorable. And this is important when prospects are viewing hundreds of writers’ websites. Let’s explore 3 branding strategies to help you stand out as a freelance writer. The number one personal branding element I tell new freelance writers is to create a consistent visual identity across your professional websites and social media platforms. This helps prospective clients easily find and remember you, no matter if they look on LinkedIn, Google+, or Twitter. There are many ways to create a unique visual identity that is on par with your personal brand. For my business, I tailored my website to fit my brand by creating a tagline, I add color to your content. Create your own images and add your Personal URL Watermark to them. This helps when you share images on Pinterest or Facebook as it maximizes your content reach by exposing your brand to new viewers. You can create free custom images with Canva or Picmonkey. Have a professional headshot of yourself on your home page. You don’t have to spend a lot of money – in fact, I just had my husband take photos of me using his iPhone. Again, this helps new prospects who happen to land on your page to connect your message to a face. Another way to brand yourself is to create a Gravatar. This is an image that follows you whenever you leave a comment on a blog. It also displays your bio (that you provide) attached to your Gravatar so that when someone hovers over your image, they can immediately see who you are and what you do. It’s free to sign up and is strongly recommended if you want to make a name for yourself online. Lastly, when creating a visual identity for your brand, make sure to optimize your logo for each social media platform. For Facebook, it must be at least 850 pixels wide and 300 pixels tall. Twitter’s profile header dimensions are 1263 pixels wide by 421 pixels tall, if you don’t want Twitter to resize it, otherwise you can use a 1500×500 image. With Google+, the best size for your header profile image is 1080 pixels wide by 608 pixels tall. Make sure to save your images as a PNG rather than JPG for your social media header images. Facebook, Twitter, and Google+ heavily compresses your image for faster upload. When you initially save your image as a JPG on your computer, it already compresses it. So, having a re-compressed image looks blurry and pixelated. If you find that your original image is still too large, you can crunch it yourself without losing too much clarity. I use the free version of Kraken, where you can optimize your images. Your brand doesn’t stop at your website or on social media. It should be integrated in all areas of your freelance writing business. An author byline can help you extend your brand and at the same time, inject personality, making your bio memorable in the minds of prospects. What are some elements to creating a memorable author byline? It’s specific. It provides information about your services and can also mention your specialty niches. It’s directional. It leads the reader back to your website or Hire Me page. This increases the chances of landing a gig. It’s beneficial. 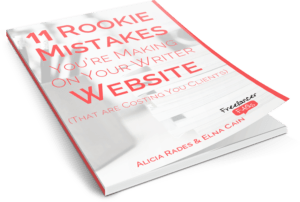 It has links to free (or paid) resources that can benefit the reader as well as lead them back to your website, where you want prospects to linger. It’s tailored. It’s specific to what website you’re guest posting on. If you guest post on a techy website, include your interest in technology. Similarly, if you guest post on a travel blog, provide information about your love of traveling. It’s personable. It has a bit of wit as a way to get into the heads of viewers. While not every freelance writer’s byline has these specific elements, many do and many of them are highly successful. Let’s take a look at some memorable author bylines that have a pop of personality embedded in their marketing strategy. Irene Enriquez is a freelance writer and communications specialist. She works with tech startups, loves Yoga, and is currently pursuing a master’s degree in Communication. She thinks these three things make her super cool. Visit GirlyGeek.ph to get a glimpse of how she used her blog to attract her dream clients. Amy Dunn Moscoso is a freelance B2B marketing writer based in Tianjin, China. Amy’s been sharpening her negotiation tactics with help from the local fruit seller. With her new-found negotiation skills, she’s allowed clients to get uncomfortable enough to pay her ideal rates, plus bonuses. You can find Amy at www.contentsiren.com and or on her LinkedIn page. A lot of freelance writers don’t realize their About page is another opportunity to tell people why they should hire you. Find a way to market yourself and at the same time tell prospective clients unique facts about you. For me, being a Millennial mother of twin toddlers is my unique selling point. I also make it clear that I’ve been featured on popular websites as this helps potential clients see that other people value my writing enough to post it on their website. Lastly, I tell future prospects the number one reason why they should hire me — and not any of the other freelance writers out there with more clients, more experience, and more success. When you lay out how you can help businesses with your content, your unique selling point(s) and the one thing that makes you truly stand out, you’ve got a winning About page. Okay, you’ve learned how important it is to have a personal brand to market your services. When you have a brand that’s consistent online and offline, it makes it that much easier for business owners to remember you and think of you for their next press release or newsletter. You’ve also learned how you can design a memorable brand as a way to stand out amongst other freelance writers. When you create a solid visual identity, an enticing author bio and an About page that sells, you’ve set the foundation for a professional and credible brand. Now, as a new freelance writer, here are some action steps you can start using today to create a personal brand that stands out. Answer this question to help you write your About page: How can I help businesses with my writing so that it generates more business for them? Look at several bylines from freelance writers (for example: on Be a Freelance Blogger, Be a Freelance Writer, and The Write Life) to get inspiration when thinking up your own. Look at your website and social media profiles and see how you can create a consistent visual identity. For example, making a logo that can be used on your website and on your social media profiles. What are some ways you stand out as a freelance writer? Tell us in the comments. How Can I Use SEO For My Freelance Writer Site? Great tips, Elna! I love your tips about the photos. I didn’t know that saving as PNG images would make it less blurry. I recently learned about social media headers and thought it would help your readers! Thanks again for having me contribute to your blog! Great post, Elna. While I’m pretty happy with my author bio and about page, I struggle with visual branding on a daily basis. Thanks for great info and ideas! Creating a visual identity can be a challenge for many solopreneurs. It took me many months to decide on my brand of being colorful with words. As long as you’re landing clients and receiving consistent work, I wouldn’t worry about your brand at the moment. For new freelance writers, though, creating a visual identity will make it that much easier to land gigs! It’s nice to see you have learned a lot of the tricks of the trade already. You’re sure to be successful in your chosen niche! Congratulations on how far you’ve come in such a short time! I’ve thought the same thing about her! It’s cool to see writers like Elna succeed so fast when a lot of us flounder around for years before we figure anything out. I sure learned a lot in a short amount of time. I’m like a sponge! I feel if you want to succeed in freelance writing (or with any career choice) you need to learn and adapt. From all the learning I’ve been doing, I’ve come to realize I gravitate towards marketing and branding strategies and now I can say that’s part of my niche of topics. I had to come back to this article to read more about your tips on creating a visual identity. That’s one thing I am really thinking about lately. I would really love to hear more tips on this. I do keep a consistent headshot across the Internet, but given your advice, I feel like I could do more to create a brand image. Do you suggest going with a specific tagline, or do you advise more toward having a consistent logo? I’m thinking that my website could use a unique logo and tagline. I used to have an owl on my header with the tagline “I’m a write owl.” I think that’s creative, but I didn’t really feel like it reflected my brand because I wanted to focus more on freelance blogging rather than freelance writing in general. Plus, the owl seemed to take up too much visual space in my header. I’m also really interested to know where you got your background image. Did you have someone make it for you, or is that just a stock image? In regards to your visual identity, I would stick to a consistent logo. You could incorporate a tagline in your logo (like I did). Although my logo, isn’t anything extravagant, I like that it’s simple and easy to read (i.e. not a lot of words). As for my pattern, I got that at http://thepatternlibrary.com/ It’s free design art. I think you’re doing a good job with developing your visual identity. I know you are toying with your headshot on your landing page (it seems to change), but I’m sure you’ll find a good one. I did see your owl before, and it was a good decision, on your part, to remove it. It didn’t really reflect “writing” IMHO. I know you also have an author visual identity and I don’t know if you wan to keep those separate? Thanks for your kind words! Yes, I’m really interested in the branding and marketing aspect business. That is why I enjoy your blog so much! You provide sound advice for businesses and I thank you very much. I’m glad you enjoyed my post! Thanks for commenting. This was a great post. This is the second time I’m reading it. It’s a good thing you are helping writers, especially new ones, with very useful writing tips. Glad you liked my post! Yes, it’s important as a new writer to find ways to separate yourself from the crowd. I found these things in the post to help me in a big way!